A man from France with a passion for planes has built himself a fully functioning, full size Boeing 737 flight simulator in his bedroom. 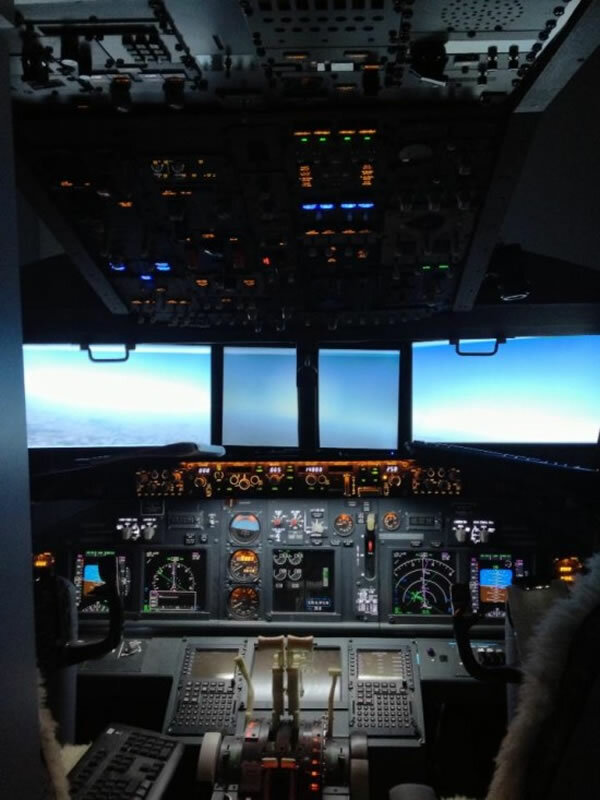 It’s not going to make his house airborne, but Laurent Aigon’s home-made Boeing 737 cockpit is so realistic that the Institute of Aircraft Maintenance at Bordeaux-Merignac Airport asked him to give a lecture on his achievement, and an aircraft maintenance company contacted him about using his creation for simulations. 40-year-old Laurent Aigon, from Lacanau, France, has always had a thing for airplanes. He grew up in Beutre, just 200 meters from the Merignac Airport, where he used to spend most of his time watching planes land and take-off, daydreaming that one day he would be the one behind the yoke. At 12-years old he had his first plane-flying experience, in front of his computer screen, playing Flight Simulator, but he was just too lazy for school and never went on to become a real pilot. Still his childhood dream stuck with him, and one day he decided that if he couldn’t fly a real plane, he was going to fly a fake one, right in the comfort of his own home. Five years ago, he met Jean-Paul Dupuy, a like-minded aircraft enthusiast, and together they set out to build the most realistic simulation cockpit possible. They met with the people of Aquitaine Simulation, and got a glimpse of their Airbus flight simulator. Confident they could build their own functional cockpit, Laurent and Jean-Paul scoured the Internet for parts, and piece by piece, module by module, they managed to put together one of the world’s most realistic Boeing 737 cockpits. The fact that it’s crammed between a closet and a bunk-bed in a bedroom is of little importance. During the last five years, Laurent Aigon spent thousands of hours trying to connect all the necessary parts into the accurate airplane dashboard of his dreams. It also cost him a few thousand euros, as the components had to be shipped from all around the world, but Laurent doesn’t have any regrets. His creation allows him to experience what it’s like to lift a Boeing 737 to beyond the clouds and bring it back on the ground safely, without him having to leave the house. He taught himself not only how to operate all the cockpit controls, but also the flying procedures, so he’s literally able to maneuver the virtual plane like a real pilot. But now that his project is complete, he has a new life goal, to become a professional aircraft simulator builder, and create training equipment for future pilots. He has already done it for himself, so why not do it for others as well? But for that he needs a special certification, which he hopes to obtain in the next five years.